Amazon.com description: Product Description: Technology is ubiquitous, and its potential to transform learning is immense. 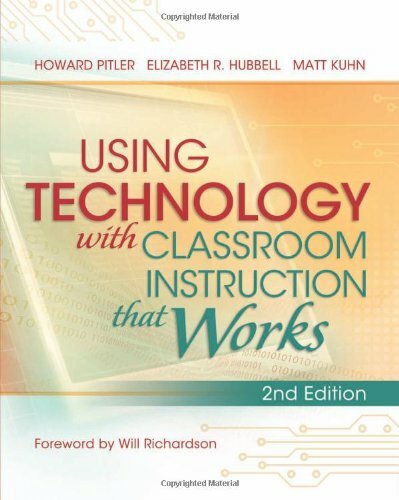 The first edition of Using Technology with Classroom Instruction That Works answered some vital questions about 21st century teaching and learning: What are the best ways to incorporate technology into the curriculum? What kinds of technology will best support particular learning tasks and objectives? How does a teacher ensure that technology use will enhance instruction rather than distract from it? Each strategy-focused chapter features examples across grade levels and subject areas, and drawn from real-life lesson plans and projects of teachers integrating relevant technology in the classroom in ways that are engaging and inspiring to students. The authors also recommend dozens of word processing applications, spreadsheet generators, educational games, data collection tools, and online resources that can help make lessons more fun, more challenging, and most of all more effective. About: Technology is ubiquitous, and its potential to transform learning is immense.